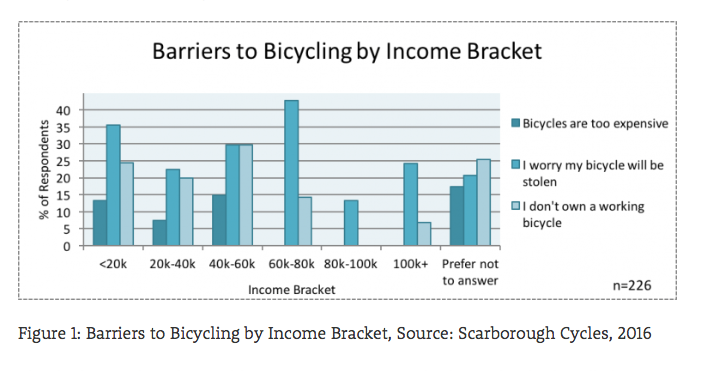 A 2016 survey conducted by University of Toronto researchers as part of the Scarborough Cycles project found those in lower incomes brackets were more likely to respond that financial concerns were part of the reason why they would choose not to bicycle, even if the weather was good. Specifically, 10-15% of those with incomes under $60,000 believe that bicycles are too expensive. Similarly, 20-30% of these individuals did not own a working bicycle. Although worry that the bicycle might be stolen was a concern regardless of income, those in lower income brackets were more likely to list this as a barrier to cycling than those in higher income brackets. This is an excerpt from an article published in Spacing, written by Emma Heffernan, a research assistant for both the Toronto Cycling Think & Do Tank at the University of Toronto and TCAT’s Scarborough Cycles Project.